Fitbit Pay is a mobile payment system, similar to Apple Pay, Google Pay, and Samsung Pay. It works with any retailer that accepts contactless payments. The key difference is that Fitbit Pay works only with the company’s smartwatches and fitness bands, not smartphones. You can store as many as six credit cards in your Fitbit Wallet, and once you set it up, you can leave your smartphone at home, and make purchases on-the-go, which is super convenient when you’re working out, and don’t want to carry anything extra. Here’s how to use Fitbit Pay and how it stacks up against the competition. To use Fitbit Pay, you need a compatible Fitbit device, which includes the Ionic and Versa smartwatches and the Charge 3 fitness band. Mobile payments require NFC (near-field communication) and a display. If your Fitbit doesn’t have a screen, it definitely won’t work with Fitbit Pay. 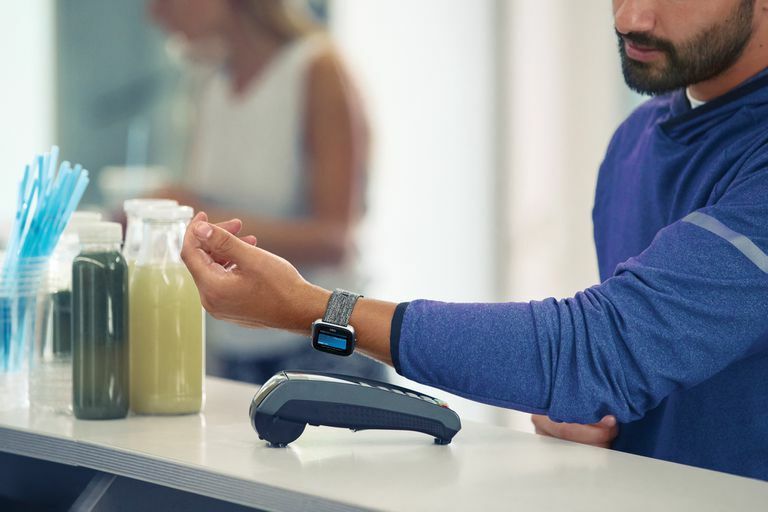 When you’re ready to set up Fitbit Pay, make sure your compatible device is nearby. First, check Fitbit’s running list of participating banks, which also includes countries where the service is available (more than 20 at launch). On your smartphone, launch the Fitbit app. Tap the Account icon on the top right. Follow the on-screen instructions to add a payment card. You can add up to six cards to the Wallet (five for Charge 3), and set one as the default payment option. The first time you add a card to Fitbit Pay, you’ll also be prompted to set a 4-digit PIN code for your device. You’ll also need to have an unlock passcode for your phone. Next, follow the on-screen instructions to enable phone notifications. During setup, you must choose a default card, but you can change that at any time. Launch the Fitbit app on your smartphone. Find the card you want to set as the default option. Once you’ve set up Fitbit Pay, you can use it whether you have your smartphone on hand or not. So if you’re out taking a job and need refreshments or a snack, you can leave your phone at home. At the register, press and hold the left button on your device for two seconds. Swipe to the Payments screen if it doesn’t pop up. If prompted, enter your 4-digit PIN code. Your default card appears on the screen. To pay with your default card, hold your wrist near the payment terminal. To pay with a different card: swipe up on Ionic and Versa, or tap the Charge 3’s screen, to find the card you want to use. Then hold your wrist near the payment terminal. When the payment is complete, your device vibrates, and there’s a confirmation message on the screen. Are you having trouble using Fitbit Pay? Make sure the device screen is close to the reader and tell the cashier that you’re using a mobile payment. If you still can’t get it to work, try change the default payment card, or calling your bank. How Does Fitbit Pay Compare to the Competition? Fitbit Pay is most similar to Apple Pay and Google Pay in that it works any place that accepts contactless payments. Samsung Pay sets itself apart since it has technology that makes it compatible with any retailer that takes credit cards. The other difference is that Fitbit Pay stores only credit or debit cards. Apple, Google, and Samsung Pay each allow you to store loyalty, membership, rewards, and gift cards in your digital wallet. In some areas, you can also store transit passes. In other words, Fitbit Pay’s three main competitors can store most of the cards in your physical wallet.